FreeUndelete is a free file recovery tool that lets you undelete files from internal and external hard drives, memory cards, flash drives, and other storage devices. The interface of the program is extremely easy to use but doesn't skimp on the necessary features. Keep reading for more about FreeUndelete or find other ways to recover deleted files. If you've tried other file recovery tools but have found them to be confusing or hard to understand, we have no doubt that you'll really like FreeUndelete. The interface is very clean and minimal, all the buttons are easily accessible, and the results are a breeze to sift through. Some files found by data recovery programs are not completely recoverable, and will therefore not work as you'd expect them to when you restore them. Fortunately, FreeUndelete tells you the recoverability status of each file before you undelete them, which will save you tons of time versus restoring dozens of files only to find that none of them work. 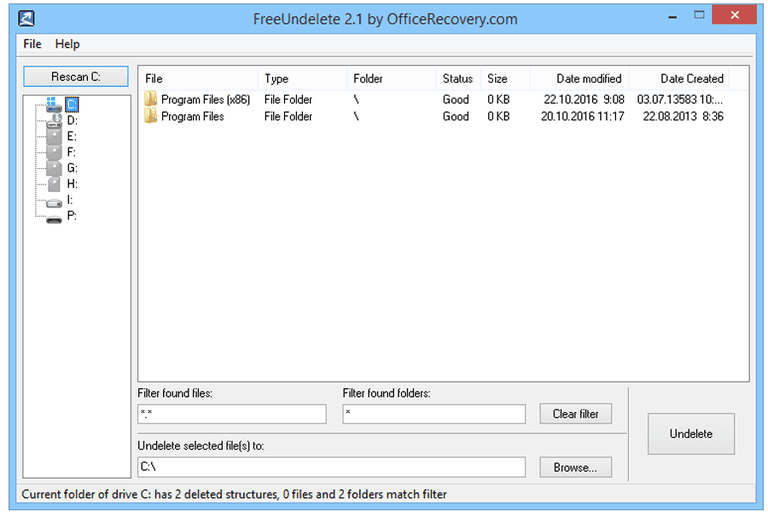 FreeUndelete can be used as a portable file recovery program instead of installing it to your computer. The disadvantage of installing it to your computer versus running it portably is that the installation files could overwrite the data you're trying to recover, which negates the entire purpose of the recovery software. To run FreeUndelete as a portable program, choose Advanced during setup, and then click the Run without installing option.